And ghetto had its own pharmacist. Under the Eagle Pharmacy is located 100 meters from our office. Passing near this building every day we feel weight of history. This is very special place, during time of Kraków Ghetto it was the only pharmacy still working. Its owner – Tadeusz Pankiewicz – was not an ordinary man either. In the time of German occupation he was trying to help as many ghetto Jews as he could. Tadeusz wasn’t the first pharmacist in Pankiewicz family. His father, Józef also worked in this profession – it was him, who established Under the Eagle Pharmacy. „Ghetto pharmacist” was born in Sambor and got his education in Kraków. He has been working Under the Eagle since 1930. Four years later he became the manager. Pankiewicz was very handsome, elegant, charismatic and refined man. He had great passion in traveling. But first of all, he was a good person. When Germans established the Ghetto, pharmacist made everything, to stay in his drugstore and help people. Occupants offered him transfer to one of the Jewish pharmacies in the center of the city, but Pankiewicz didn’t consent. Assure, that he will hire only Aryans. Promise to not to speak with Jews on other themes, than these strictly connected with medical issues. Influence on Nazis decision had the fear of possibility of outbreak – so Under the Eagle could work and Pankiewicz stayed as its owner and manager. He wasn’t alone. There were also three employees in the drugstore: pharmacist Irena Droździkowska (September 10, 1939 – February 28, 1951), and two students – Aurelia Czort, nee Danek (May 1, 1941 – September 1, 1945) and Helena Krywaniuk (December 5, 1941 – October 31, 1950). Both students completed their education on Jagiellonian University after II World War. Under the Eagle was the only pharmacy working during the time of Kraków Ghetto. Pankiewicz and his coworkers were trying to made there substitute of normality, place where people could meet to exchange information and opinions. Pharmacy was connecting two worlds – the one behind the wall, and the one theoretically free. Apothecary was organizing meetings between Jews and Poles. For example, it was him who make the conversation between professor Ważewski and amateur mathematician Rappaport happen. Pharmacy workers were transferring information and correspondence. They were smuggling drugs and food from the city, keeping valuable items (for example: Torahs, documents, scientific works) and protecting Jews from being arrested. Apothecary was regularly issuing certificates, claiming that said drug is unavailable in his pharmacy – thanks to that, patient could receive temporary pass to the city. Pankiewicz was also intervening for the detainees. Despite the permission received from Germans, pharmacist could not feel safe. It was a miracle, that he avoided being taken to extermination camp in Bełżec. Once, regular visitor of pharmacy, SS-Hauptsturmführer Kunde asked Pankiewicz to take part in the „joke”. He planned to cuff him, walk out of drugstore and shoot in the air, to make everyone think, that the German shot the pharmacist. Everything went as soldier said, but during the whole „joke” Pankiewicz wasn’t sure if Kunde wasn’t in fact trying to get rid of him. Book „The Cracow Ghetto Pharmacy” was published in 1947, and contains Pankiewicz’s wartime memories. It’s unique document, describing life in ghetto. Publication was translated into several languages: Hebrew, English, German, Dutch and French. After the liquidation of ghetto pharmacist was still helping victims of war – among others, survivors of Warsaw Uprising. After war he became the manager of the nationalized pharmacy, which then was renamed as State-owned enterprise. Public Pharmacy 31. He was working on this position till 1953, then he moved to drugstore on 29 listopada street. Former Under the Eagle pharmacy was transferred to the other address: plac Bohaterów Getta 11. In the old building they opened restaurant: Bar Nadwiślański. Restaurant was working till 1981, then the decision was made to establish the museum. The inauguration took place two years later. Functioning of the new museum was supported by, among the others, Steven Spielberg (and pharmacy was shown in his “Shindler’s list”) and Roman Polański (who was the prisoner of the ghetto himself). Since 2013 there is permanent exhibition, recreating interior of pharmacy from the times of Pankiewicz.. Under the Eagle pharmacy is the important part of Memory Trail 1939-1956. In 1983 Pankiewicz was recognized as „Righteous Among the Nations”. 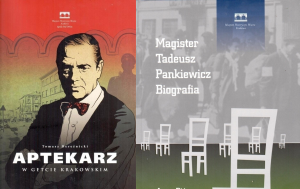 Anna Pióro, curator of Under the Eagle pharmacy museum, wrote a book „Magister Tadeusz Pankiewicz. A Biography”, and artist Tomasz Bereźnicki created graphic novel about wartime experiences of pharmacist. Both publications are available in Polish and English. As I said in the beginning of this article – Under the Eagle Pharmacy is constant part of our neighborhood. All the time it reminds us that despite the enormity of the suffering that took place here, there were also hope, there were good people in those terrible years. From the windows of our office every day we can see a thousands of tourists visiting the Pankiewicz’s pharmacy and we are sure that the memory of the brave pharmacist will never be lost. Surprising discoveries. One of the reasons, why our job is our passion.